Abbey Bartlet: How did you live with him? He beat Max out of the 12 million earmarked for vaccine education and when I said I wanted the 12 million, he said, “So did I. And at the end of the prizefight, you look at the guy who’s dancing around and that’s who won.” … Don’t you wanna kill him when he says things like that? Amy: My problem is I wanna jump him when he says things like that. Amy portrays an aggressive, no-nonsense activist, former Director of the Women’s Leadership Coalition, and subsequently Abbey Bartlet’s Chief of Staff. Political victory can be an aphrodisiac in Washington. And despite Republican complaints that the deal did not go far enough, after the month-long debt ceiling prizefight it’s the Tea Party representatives in the House who are dancing around the ring, or they should be. The advocates of smaller government have won a huge victory. In January, President Obama demanded a “clean” debt ceiling increase, one not tied to any spending cuts or entitlement reform. Then he pinned his prestige to the notion that any deal must be “balanced,” a code word for tax increases. But at the end of the day, he was forced today to sign a bill making dollar-for-dollar spending reductions in exchange for a debt-ceiling increase of $2.1 trillion, without a dollar in tax hikes. In just six months, they shifted the debate from whether there would be spending cuts to how much would those cuts be. Hey, what ever happened to civility? Gracious. Taranto’s closing line refers to the phony liberal calls for “civility” after much of the news media jumped to the incorrect conclusion that Rep. Gabby Gifford had been shot by a right-wing nut egged on by conservative rhetoric in Arizona. This is nonsense on stilts. In fact, the Tea Party members, who were elected in 2010 in a historic rebuke to Obamacare and the Democrats’ free-spending ways, have just used the “political democratic process” to win an important victory on behalf of smaller government. Nobody was going to blow up anything. Tea Party members were elected with what they believe is a mandate to reduce the size of government. It would have been irresponsible of them to pass up a chance to start moving in that direction. I have to say I’m quite tired of hearing dismissive put-downs of the Tea Party. I don’t agree with everything they say, but I don’t agree with everything either the Democrats or Republicans say, either. 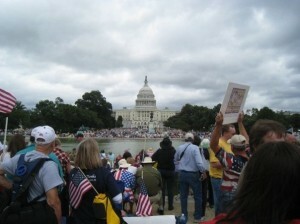 The Tea Party shows signs of staying power, it may be an important force in American politics for years to come. Consider: There are 60 Representatives in the House who self-identify as members of the Tea Party Caucus. That’s one out of every four Republicans, one out of every seven representatives. By way of comparison, the Congressional Black Caucus, which has been a powerful constituency in the Democratic Party since the 1970s, currently has 43 members. So to Rachel Maddow and Bill Maher and the Kos Kiddies and other giggling commentators who have taken such delight in misreferring to the Tea Party with a slang term for an obscure sexual act, this would be a good time to consider growing up. This is just a ridiculous time. If small government is always so great, then the ideal would have been no government! Given the premise would cause chaos, then the only responsible objective is right-size government. Oh, and prosperity coming from deficit control. Like we last had with the Clintons. Given that the way we strayed from that time was principally due to the defense budget and individual tax cuts (not corporate tax cuts or job or investment incentives), then the question is whether we want to keep those extravagances or cut other things that contributed to our prosperity in 2000. Oh, BTW, we have suffered the equivalent of austerity in the last two years due to lowered consumer spending, do we have all the jobs and investment to show from cutting to the bone? What we have to show is healthcare most like, in Europe, Turkey and Cyprus. We are not a shining beacon to the world in that we have a government body with 2% administrative costs (Medicare) and we choose to instead pay payola to private insurers with 20% costs. Would create more wealth and prosperity in the country to pay for it the other way or let Medicare compete, rather than prosperity for healthcare insurers. A risicuous time.